Downtown Apartments. Walking Distance to CSU. Walker & Weeks is a 36-unit apartment building located in the heart of the Cleveland State Campus. Located one block from Fenn Tower and the Sports Complex. This fully renovated, historic building dates back to 1927 and has been completely updated blending the modern conveniences of new construction with the original neo-classic architecture of the past. Whether it’s a smart one bedroom, a spacious two bedroom or a generous three bedroom, Walker & Weeks has a unique floor plan designed just for you. Several suites have private sundecks overlooking an impressive Downtown skyline, or soak up the sun on the community rooftop sundeck! Each suite boasts beautiful, new hardwood floors, huge windows, open floor plans, high ceilings spacious room sizes and heated indoor parking garage. 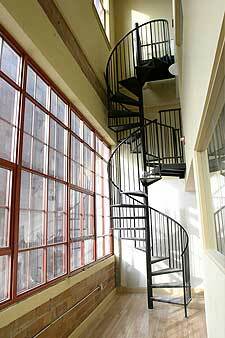 Many of the suites are two or three stories with spiral staircases connecting each floor and lofts overlooking luxurious living spaces. 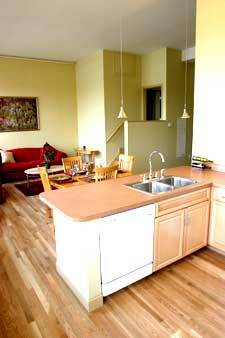 Walker & Weeks is Cleveland’s first residential “green” building. Environmentally friendly and energy efficient building products were used in renovating this historic, downtown building. Energy efficient appliances and building systems were installed, like a health conscious, heating and air conditioning system. Designed to provide a clean living environment. Did We Mention Conveniently Located? Located near Cleveland State University, Walker & Weeks’ highway access to Interstates 90, 77, and 71 is unbeatable. It's only a short drive from our heated, indoor parking garage to the Warehouse District, University Circle, and Cleveland Hopkins International Airport.